(Nanowerk News) A unique inside look at the electronic structure of a highly touted metal-organic framework (MOF) as it is adsorbing carbon dioxide gas should help in the design of new and improved MOFs for carbon capture and storage. Researchers with the U.S. Department of Energy (DOE)’s Lawrence Berkeley National Laboratory (Berkeley Lab) have recorded the first in situ electronic structure observations of the adsorption of carbon dioxide inside Mg-MOF-74, an open metal site MOF that has emerged as one of the most promising strategies for capturing and storing greenhouse gases. Working at Berkeley Lab’s Advanced Light Source (ALS), a team led by Jeff Kortright of Berkeley Lab’s Materials Sciences Division, used the X-ray spectroscopy technique known as Near Edge X-ray Absorption Fine Structure (NEXAFS) to obtain what are believed to be the first ever measurements of chemical and electronic signatures inside of a MOF during gas adsorption. Kortright is the corresponding author of a paper describing these results in the Journal of the American Chemical Society (JACS). The paper is titled “Probing Adsorption Interactions In Metal-Organic Frameworks Using X-ray Spectroscopy”. Co-authors are Walter Drisdell, Roberta Poloni, Thomas McDonald, Jeffrey Long, Berend Smit, Jeffrey Neaton and David Prendergast. Mg-MOF-74 is an open metal site MOF whose porous crystalline structure could enable it to serve as a storage vessel for capturing and containing the carbon dioxide emitted from coal-burning power plants. Carbon dioxide gas released during the burning of coal is one of the primary greenhouse gases responsible for exacerbating global climate change. However, with the world’s largest estimated recoverable reserves of coal, the United States will continue to rely on coal-burning power plants to generate electricity for the foreseeable future. This presents a pressing need to develop effective and economical means of removing carbon dioxide from flues before it enters the atmosphere. MOFs are molecular systems consisting of a metal oxide center surrounded by organic “linker” molecules that form a highly porous three-dimensional crystal framework. This microporous crystal structure enables MOFs to serve as storage vessels with a sponge-like capacity for capturing and containing greenhouse gases. 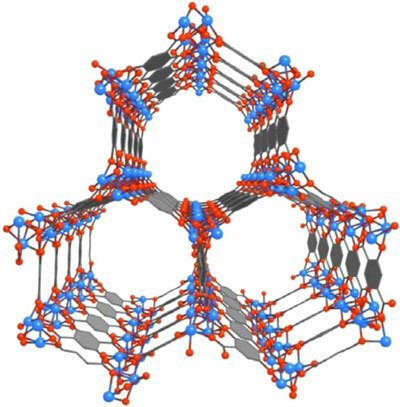 When a solvent molecule applied during the formation of the MOF is subsequently removed, the result is an unsaturated “open” metal site MOF that has a strong affinity for carbon dioxide. To examine adsorption in Mg-MOF-74, lead author Drisdell, a post-doc in Kortright’s research group, designed a special gas cell that enabled NEXAFS measurements to be made as carbon dioxide pressure was varied from vacuum up to 100 Torr at ambient temperature. This capability provided the means to make direct comparisons between empty and bound sites of the same Mg-MOF-74 sample. NEXAFS measurements were made at ALS beamline 6.3.1, a bending magnet beamline optimized for X-ray absorption spectroscopy. “NEXAFS spectroscopy is an element-specific technique, probing the unoccupied electronic states associated with the excited atom,” Drisdell says. “NEXAFS measurements allow us to determine how the electronic interactions differ for different adsorbed species and for binding sites in a larger framework. First principles calculations were performed in collaboration with co-author Prendergast, a nanostructures theorist also with Berkeley Lab’s Materials Sciences Division, to provide a theoretical model as to what should happen inside Mg-MOF-74 during adsorption of carbon dioxide. With their results having established NEXAFS spectroscopy as an effective experimental tool for the study of MOFs and gas adsorption, Kortright expects to see many more studies of fundamental adsorption interactions inside of MOFs. In addition to the ALS, Kortright, Drisdell and their colleagues also called upon the resources of the National Energy Research Scientific Computing Center (NERSC)’s “Lawrencium” supercomputer and the Molecular Foundry computing clusters “Nano” and “Vulcan” for the first principles calculations. Like the ALS, NERSC and the Molecular Foundry are DOE national user facilities hosted by Berkeley Lab. “This study is an excellent example of a collaborative team of scientists from different areas working to complete a project that none could have done in isolation,” Kortright says.